Threats to computer security and data privacy are immense, with cybersecurity professionals consistently having to counter new attack methods. Quantum computing is emerging, and the availability of large-scale quantum computers is on the horizon. The threat posed by quantum computing however, is here and now. 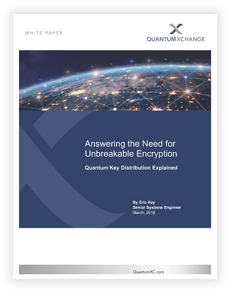 Download the white paper, "Answering the Need for Unbreakable Encryption," to learn how Quantum Key Distribution (QKD) offers the most complete, secure solution that can be implemented today to secure data from the threat of quantum computing. Because the security is based on physics, not complex math, there is no threat from advances in computing, quantum or otherwise, that will break QKD. Get the information you need to understand this emerging attack vector.